On Saturday, 2 February 2019, Sol Plaatje University (SPU) welcomed over six hundred first-entering students and their families – its biggest group ever of new students as SPU begins its sixth year of existence. The rapid growth of SPU will have a positive impact on the social and economic life of Kimberley and it is a strong indication of the University’s successful trajectory towards a compliment of 7,500 students in 2025. The first session began at 09:00 in the Examination Venue on the Central Campus for students in the School of Humanities and the School of Natural and Applied Sciences. The second session was held at 11:00, in the same venue, for students in the School of Economic and Management Studies and the School of Education. In her welcoming remarks the Acting Vice-Chancellor, Professor Jean Baxen told the new students and their parents that “SPU has high standards for which it makes no apology. It does not settle for mediocrity or the lowest common denominator. “The goal of the staff is to walk this academic journey with the students and create conducive and discursive spaces that will cultivate them into some of the finest young minds in South Africa”. Professor Baxen said they are the “fortunate ones who not only completed high school but did so with diplomas and bachelor passes that enabled them to sit there today”. She informed them that they were now a “member of an elite group of higher education students. They had traversed and navigated a complex set of circumstances to find themselves at this institution, but they nevertheless had made it”. 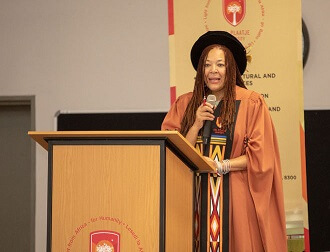 She reminded them that of their peers who began the schooling journey with them many may not have completed matric and if they did, may not have obtained a pass that merited their access into a higher education institution. It is for this reason that she referred to them as elite. She also reminded them that success and great grades are not an option and that they should enjoy the way and take full advantage of what is on offer at our great institution. The Deputy President of the SRC, Ms Nomathamsanqa Qiza, welcomed the new students and their families. She encouraged the students to become the principal authors of the next chapter of their lives. Firstly, to take responsibility for their learning by ensuring that they fulfil their academic commitments and to seek help when they need it, from friends, peers and to use the student support services available to them. Her second message was for them to make the most of their time at SPU. Thirdly, to embrace the diversity that they will encounter at the University. She advised that their journey would be daunting and exciting but also empowering. The first-entering students in 2019 come from all nine provinces in South Africa and are registered across the full bouquet of programmes offered by the University. 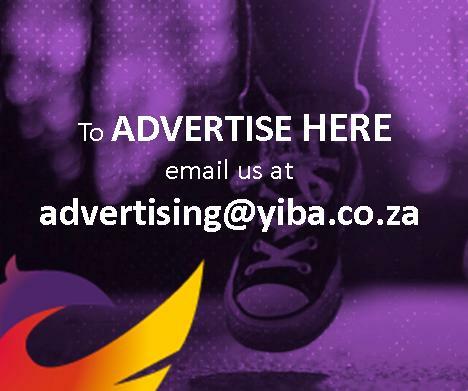 These include: Bachelor of Arts, Bachelor of Commerce, Bachelor of Education, Bachelor of Science, Bachelor of Science in Data Science, Heritage Studies, ICT and Retail Business Management. Bachelor of Social Sciences (Honours) in Sociology. Later this year, SPU will register students in the Postgraduate Diploma in Public Management. The University was given approval to register students in 10 new programmes of which 8 are postgraduate qualifications.